If you’re looking for an area of town where the shopping scene reflects a more unique and passionate side of Buenos Aires, spend a day wandering the smaller La Boca neighborhood. La Boca is one of Buenos Aires’ most photographed neighborhoods thanks to its brightly painted houses that form a kaleidoscope of color on its cobblestone streets. The riot of color is the result of the neighborhood’s working class roots—port workers used paint from the repainting of shipping containers to give color to the metal siding used to construct their homes. Because La Boca is so different in appearance from the rest of bustling Buenos Aires, it attracts bus-loads of tourists to its small weekend fair and little shops, and is there for a great place to find small trinkets to take home to family and friends. Your best bet for finding magnets, key chains, t-shirts, mugs and the like is in one of the stores either on Iberlucea or Magallanes streets. While there are also some stores on side streets, the main shopping and sightseeing area of La Boca is on Iberlucea between Olavarria and Magallanes, and Magallanes up to C.F. Melo Street. 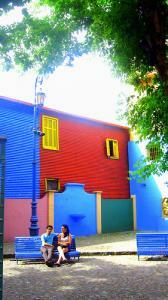 Caminito, Boca’s most famous street, has colorful photo opportunities and artisans selling original works. 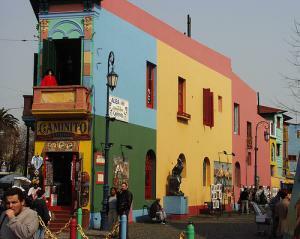 Despite its somewhat tougher reputation, La Boca is perfectly safe during the day and, along with the numerous cafes lining the main shopping routes, one can make a quite pleasant afternoon exploring its knick-knack shops. It is also where the old port used to be centered, so there are plenty of photo opportunities by the water as well. If you’re traveling with a soccer/futbol fan continue down Iberlucea, away from the water, until you get to Brandsen street. The La Boca team stadium is on your left. Not only can you check out the team’s official museum but you can buy official gear there or at one of the gift shops nearby. The area is generally livelier on the weekends thanks to the influx of tourists. On Sunday there is a small feria (market) on Iberlucea selling assorted clothing and artesian items. When you’re in La Boca make sure you explore the many smaller caminitas off of Magallanes, there are smaller, more distinctive shops where you can find better deals on souvenirs.